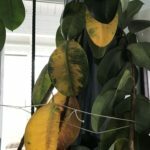 I have a rubber tree that is one branch or trunk and has remained so for over five years. It's about 30" tall with about ten leaves. It's in a 6" clay pot. 1) Is this plant going to sprout branches? Or continue to grow with the one skinny branch/trunk? 2) I'm wondering if it needs a bigger pot. 3) Due to its tall, lanky nature, it always needs to be propped up. What's the best way to do that? @ Volcano, sorry to dispute, but rubber trees are commonly used as houseplants, and have been for over a hundred years. Of course in one sense, no plant is "meant" to be in a pot, meaning that no plant actually evolved in a pot. But the wonder of so many species is that they are adaptable enough to continue to live and thrive in such an unnatural environment as a pot in a house. Of course, the poster doesn't mention where they live, so they might be confused by the advice to plant outside, since these are tropical plants, and if you try to plant one outdoors in a temperate region, it will die over the winter. To return to the original post, the first thing I noticed is that 6" pot for a 30" plant is way to small. Tie it tightly to the tree i mean. Trees like that don't do well in pots, its roots have probably taken up the whole pot and have nowhere else to go, if you move it to a bigger pot then it will eventually grow into that one and you will face the same problem. As rubber trees are not meant to be a houseplant then they are going to do better outside in the ground. Also if you do plant it in the ground, there is a chance of " shock". The plant will look like it will die, lose some leaves, and not grow, it might actually die. When you plant it in the ground, try not to disturb the dirt the roots have, that will probably prevent shock. as for supporting it, take 4 poles and put them firmly into the ground on all 4 sides, attack string or rope to them and tie it tightly against the tree. make sure all ropes are firm and even and you should be fine.